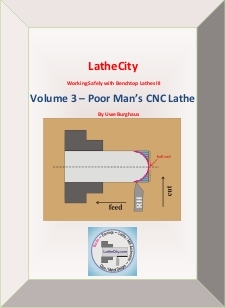 Synopsis: Having good resources makes learning CNC much easier. Unfortunately, documentation directly from Sherline is close to non-existing. As of fall 2015, their $2000+ CNC lathes come only with an online/CD manual about CNC milling (!) which you would need to print by yourself. 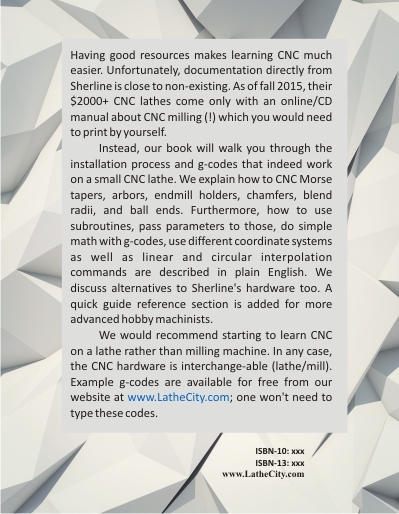 Instead, our book will walk you through the installation process and g-codes that indeed work on a small CNC lathe. We explain how to CNC Morse tapers, arbors, endmill holders, chamfers, blend radii, and ball ends. Furthermore, how to use subroutines, pass parameters to those, do simple math with g-codes, use different coordinate systems as well as linear and circular interpolation commands are described in plain English. We discuss alternatives to Sherline's hardware too. A quick guide reference section is added for more advanced hobby machinists. We would recommend starting to learn CNC on a lathe rather than milling machine. In any case, the CNC hardware is interchange-able (lathe/mill). Example g-codes are available for free from our website at www.LatheCity.com; one won't need to type these codes. Another thought: Just by browsing Amazon and eBay one can easily find 100 books titled “CNC..”. But, most of these focus on CNC mills with perhaps a few notes about lathe work; I could not find a single one featuring Sherline tools. Kindle editions and on-line distance-education classes are booming, i.e., printed text books are not the only option anymore. 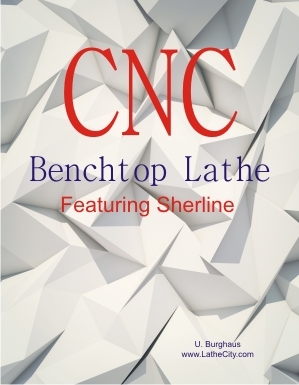 Anyway, there is not much out there for CNC lathes, hobbyists, and Sherline. CD/data DVD to this book. No returns of information products. Try out the demo before purchasing. We can also e-mail the demo files. The background of the cover image of this book is copyright by Adobe Stock and licenced to LatheCity. US customers. We ship USPS with tracking. Select media mail or priority mail. International customers. If you don't find your location in the shipping list then contact us. Don't push randomly "by now" buttons - thanks. We always look for the cheapest shipping option.